Lawrence, seen above at left, had 68 tackles, three sacks, three tackles for a loss and a fumble recovery last season. 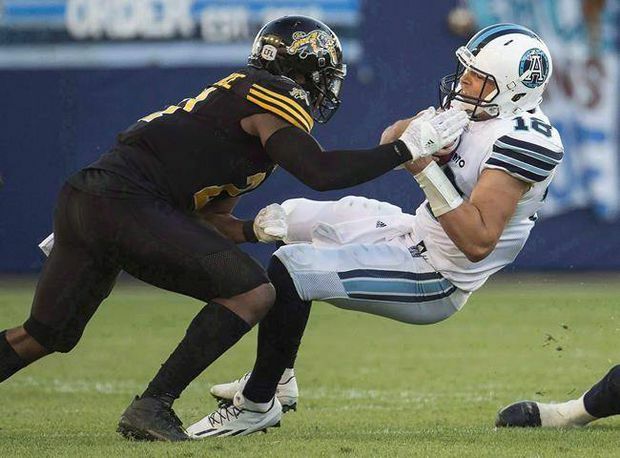 In 2018, Breaux started 14 games boundary corner for the Tiger-Cats, recording 24 defensive tackles, three fumble recoveries, two forced fumbles, two pass knock-downs and one tackle for a loss. Hurl, 28, had 41 tackles, six special-teams tackles and two tackles for a loss last season with Saskatchewan. He also had three tackles in the Riders’ 23-18 West Division semi-final loss to Winnipeg.